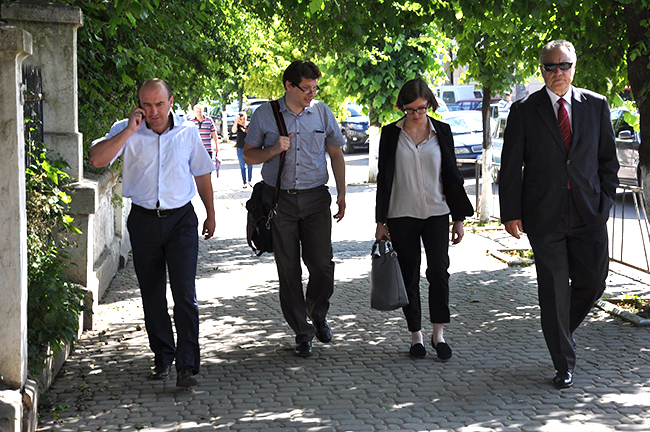 On 10th July 2015 after the completion of the first four weeks of the Sambir Police project representatives of the EUAM Regional Outreach Component Felix Gautsch, Joachim Peters and Oleksandra Mazur together with the Sambir Police Station Commander Vasyl Cherepushchyak met with the Mayor and other representatives of Sambir municipality to discussed the first results. Sambir’s Mayor Taras Kopylyak highlighted that the people already perceive the police more positively: “The police officers are much more visible in the streets and more pro-actively serve the citizens.” He added that the citizens are well aware of the active participation of the EU in this project and welcome its efforts. He also expressed his hope that the work will continue either in the form of a project in Sambir or on a permanent basis. During the meeting they were informed that Minister Avakov intents to visit Sambir in the near future to inform himself about the project and its results. The Minister of Internal Affairs plans to reform other District Police Departments of Ukraine according to the currently tested police model in Sambir. The pilot project on introducing new forms and methods of work at Sambir Police Station was launched in Lviv region on the 9th of June 2015. The joint project of the European Union Advisory Mission Ukraine (EUAM) and the Police of Lviv region aims to implement an effective Response Police. It seeks to ensure better service delivery from local police officers in terms of their response to emergency calls and the service they can provide to local citizens. The patrolling response units were deployed to all areas of the city where they are assigned for duties. The units were provided with new police cars for quicker response and more presence of police at the places where they are mostly needed.